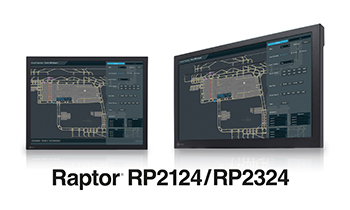 Wolfrathausen, Germany, August 18, 2015 – EIZO today announced the release of the Raptor RP2124 and RP2324 – two customizable monitors for use in air traffic control (ATC) towers. The new monitors expand EIZO’s lineup of tower-specific monitors to range from 19 to 23 inches. The Raptor RP2124 (21.3") and RP2324 (23") have a native resolution of 1600 x 1200 and 1920 x 1080 (full HD) respectively. Both monitors offer a wide dimming range from 10 cd/m2 to a high brightness of 650 cd/m2 for excellent readability of text and images in both bright and dim ambient lighting conditions. This makes them ideal for ATC towers where lighting conditions vary. The monitors are equipped with EIZO’s automated stability function which uses an internal sensor to stabilize the brightness level throughout the life of the monitor. This compensates for brightness fluctuations caused by variations in ambient temperature and the passage of time, ensuring the screen maintains high visibility. To meet individual tower requirements, EIZO offers customizability with both monitors. Multiple configurations such as panel mount and VESA mount are available for flexible installation into a console or onto an arm or stand. A touch panel variation is offered as an option for environments where a touchscreen interface is required. The touch panel variation uses analog resistive touch technology which makes it more resistant to dust and other objects for increased reliability compared to other touch technologies. The Raptor RP2124 and RP2324 are equipped with full sheet-steel industrial-grade housing for high durability. The monitors are developed, manufactured, and quality control tested in-house to ensure maximum reliability in mission-critical markets. The Raptor RP2124 and RP2324 are now available. Please contact atc@eizo.com for details.